Create a beautiful marketing report that includes all your present campaign & future campaign results! Setting up an advertising campaign for your company takes time. And once your results start coming in, it’s important to create an advertising campaign report to determine your Return On Investment (ROI). No need to waste your time figuring out which KPIs to track, our preset advertising campaign reporting template does it for you! Our online advertising campaign report includes the most important traffic, revenue, and conversion KPIs you need! This historic widget shows the total number of times that your ad was shown to your target audience, enabling you to optimize your bidding and targeting. 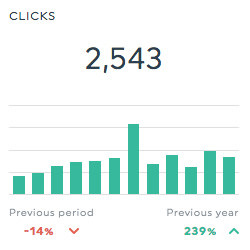 Make sure that your ad campaign copy and targeting is on point with this trend widget, which shows the total number of times that your ad was clicked on. Ensure that you're staying on budget with this historic widget, which shows the estimated total amount of money spent on the campaign or ad. 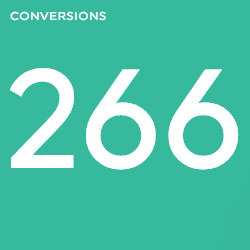 This simple number widget shows the total number of conversions that are attributed to your campaign or ad, enabling you to better determine you ad return on investment (ROI). This historic widget shows the percentage of clicks on your ad that led to a conversion. 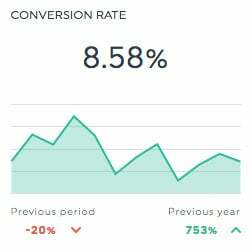 The conversion rate is calculated by dividing the number of conversions by the number of clicks, and multiplying the result by 100. Want to display your key metrics with our advertising campaign report format? With DashThis, it takes just 5 minutes! Plugging your own data sources from across a multitude of digital advertising tools into our simple advertising campaign report format is as easy as 1-2-3! Include your Google AdWords, DoubleClick Campaign Manager and Facebook Ads data sources… all in the same report! Choose the advertising campaign report template from the drop-down menu, and you’re all set! If Google AdWords, DoubleClick Campaign Manager, and Facebook Ads, aren’t enough, you can also include Google Analytics, LinkedIn Ads, Bing Ads, Instagram Ads, and more! See your advertising campaign results in DashThis today! Get 10 dashboards for 15 days! Our advertising campaign report sample is just one of many features found in our automated reporting tool. You can also customize your report the way you want to: widget layout, logos, images, comments, and more! You can add other important metrics & data than what’s in your connected advertising platforms with our CSV file manager. You can also customize the widgets, titles, you can even include an executive summary in your reports. 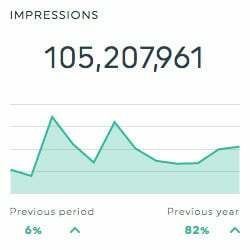 Your account can be shared with all of your colleagues, so that you’re all on the same page when it comes to your advertising campaign reports. Give your clients what they need with an advertising campaign report that fits their brand with a custom URL, a custom design, or even both! 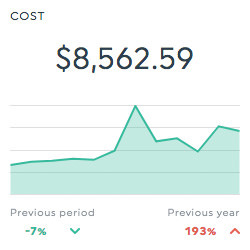 No matter what kind of advertising campaign report you’re creating, DashThis simplifies the process! Gather your Facebook Ads and Instagram Ads results in a report to figure out how your advertising campaigns on both platforms are performing. If you’re advertising on the professional network, you’ll want to collect your marketing campaign results in a LinkedIn Ads report to see what works and what can be improved. How are your Google AdWords ads performing? 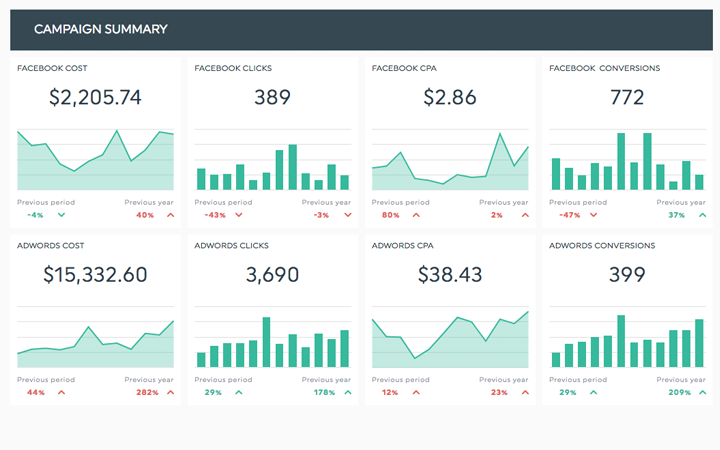 Figure it out by collecting your AdWords data in a dedicated performance report with DashThis. Track your best performing keywords and better understand the return on investment of your search traffic & SEO marketing efforts. Create monthly reports with DashThis to gather your key metrics from all your marketing channels, and use it to orient your marketing strategy. Show the evolution of your email marketing strategy’s open rate, click-through rate, conversion rate, bounce rate, and much more in a nice email marketing report with mailchimp! Need other types of report templates for your client or marketing team? We’ve got your back! Have a look! Track your landing page performance, bounce rate, page views, goal completions and all your most important analytics data to show the results of your marketing efforts overtime. Why not make your life easier by using our preset PPC Marketing report example? All you have to do is plug in your CPC marketing data, and you’re all set! Track your social media marketing performance, optimize your social media campaigns, and show your social media strategy results with our comprehensive social media report template.